In the city of Sevastopol the Ukrainian Security Service opened a photo exhibition on Holodomor, the 1930’s famine in the USSR, but local politicians have noticed that some of the pictures have nothing to do with it. “We established that some photos were taken from a US photo blog on the Great Depression of 1929-1930s. One of themmade in 1935 in Arkansas, shot by Benjamin Shahn. Another onewas taken in Oklahoma. Four out of six photos presented at the exhibition have nothing to do with Ukraine,” said city council deputy Andrey Merkulov. Historians and politicians in Russia and Ukraine are at odds about both the reasons and the death toll of the disastrous famine of the 1930s. Kiev believes the death toll was up to nine million in Ukraine alone and claims it was genocide against Ukrainians. Moscow is firm in its view that it was caused by disastrous agricultural policies of the soviet government and the death toll was half of Kiev's estimates. After being elected, President Yushchenko went on a massive campaign to have the events recognized as a crime against humanity. “We recently published 19 books about the famine. We created the first ever name-by-name death toll list. And without Yushchenko this would have never happened,” said Vasiliy Marochko, Ukrainian historian. Last November these efforts ended in monuments to the famine being erected all over the country. Some lashed out at the president for what they describe as excessive attention to things in the past, when it’s the present which requires serious attention. “He spent millions on that. That’s in the times when our doctors, teachers, workers are struggling to make ends meet. 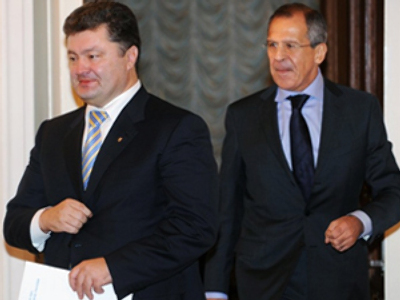 It is Yushchenko, who’s orchestrating a modern day famine in Ukraine,” said Leonid Grach, Ukrainian opposition MP. The scandal in Sevastopol is nothing new. Russian historians previously accused a similar exhibition in Kiev for displaying pictures from Russia rather than from Ukraine. With new details and twists in the famine story emerging every year, it appears the tragedy of the 1930s will be making headlines for years to come.